It may have been a frigged first week of January but summer concerts at Hollywood Casino Amphitheatre are beginning to trickle in. Starting with the announcement of the co-headlining performance of Chicago and The Doobie Brothers at Hollywood Casino Amphitheatre on June 21. Tickets will go on sale Monday January 9 at 10:00 AM. The bands will be in the middle of a two-month co=headlining tour which begin June 7 on Concord, CA and end up July 21 in Camden, NJ. 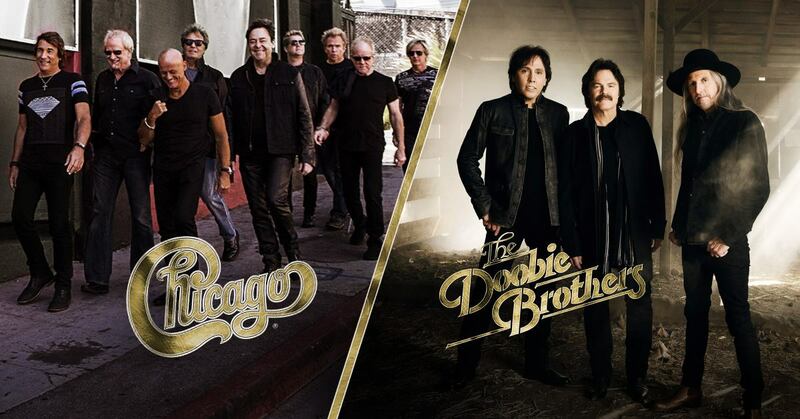 January 3, 2017 – Two of the most successful and critically-acclaimed rock bands Chicago and The Doobie Brothers – who have sold more than 150 million records combined – announced today their co-headline North American summer tour kicking off June 7, 2017 in Concord, CA. The 30+ date tour, promoted by Live Nation, will take the Grammy Award-winning and multi-platinum selling groups through amphitheatres in major cities including Los Angeles, Chicago, New York City, Toronto, Las Vegas, Atlanta and Washington, DC for a night of unforgettable live music. The tour will conclude July 30, 2017 in Virginia Beach, VA.
Tickets for the tour go on sale starting Monday, January 9 at 10 a.m. in select cities on www.livenation.com. Please see below for full tour itinerary and details. “We are so excited to once again be sharing the stage with our wonderful friends Chicago! They’re a great band, and musically we fit together very well,” said Tom Johnston of The Doobie Brothers. “We know from past experience what a great show this is going to be for the audience. I’m sure there will be some fun musical surprises along the way too. It’s going to be a great summer,” adds Patrick Simmons. Hailed as one of the “most important bands in music since the dawn of the rock and roll era” by former President Bill Clinton, the legendary rock and roll band with horns, Chicago – who celebrate their 50th anniversary as a band this year and were inducted into the Rock and Roll Hall of Fame in 2016 after receiving their first nomination – came in at #9, the highest charting American band in Billboard Magazine’s Hot 200 All-Time Top Artists. And Chicago is the first American rock band to chart Top 40 albums in six decades. Chicago’s album, Chicago Transit Authority, was inducted into the GRAMMY Hall Of Fame in 2014. Lifetime achievements include a Grammy Award, multiple American Music Awards, a star on the Hollywood Walk of Fame, a Chicago street dedicated in their honor, and keys to and proclamations from an impressive list of US cities. Record sales top the 100,000,000 mark, and include 21 Top 10 singles, 5 consecutive Number One albums, 11 Number One singles and 5 Gold singles. An incredible 25 of their 36 albums have been certified platinum, and the band has a total of 47 gold and platinum awards. Chicago have toured every year since the beginning – they’ve never missed a year. The band is now in their 50th consecutive year of touring, and continue to be true ambassadors for their beloved hometown, carrying the city’s name with pride and dignity around the world. The band’s award-winning documentary film, Now More Than Ever: The History Of Chicago, premiered on CNN on New Year’s Day 2017. Directed by Peter Pardini, the film is the most comprehensive history of the group’s achievements. Additionally, a remastered version of the band’s classic album Chicago II – CHICAGO II: STEVEN WILSON REMIX – will be available January 27.